In small bowl, mix yogurt, coconut milk and maple syrup. Spoon 1 tablespoon yogurt mixture into each of 4 (4-oz) ice pop molds or 4 (5-oz) disposable paper cups. Divide kiwifruit evenly among molds. Spoon 2 more tablespoons of yogurt mixture in each mold. Divide strawberries evenly among molds. Divide remaining yogurt mixture evenly among molds. Sprinkle each with 1 tablespoon of the granola. Gently press granola into yogurt, and insert pop mold sticks. If using cups, cover each cup with foil; insert craft stick into center of each pop. Freeze about 6 hours or until completely frozen. Follow manufacturer’s instructions for removing pops or if using cups, peel paper from pops. If your pop molds are very small, use slightly less fruit, and be careful not to overfill. Remember, the mixture will expand as it freezes. 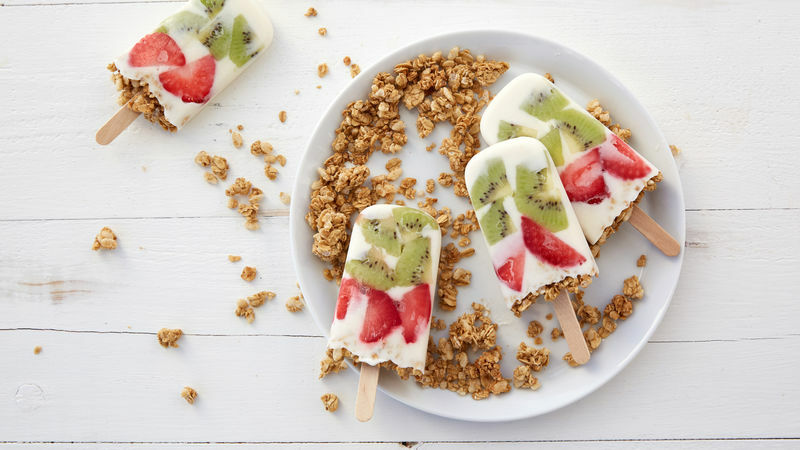 Be sure to use full-fat coconut milk (not light), as the fat helps the pops freeze nicely. After pops are fully frozen, run molds under hot water for a few seconds to pull out pops easily.